Congregate nutrition services promote the health and well being of older adults through the provision of a nutritious meal five days each week in a group setting. 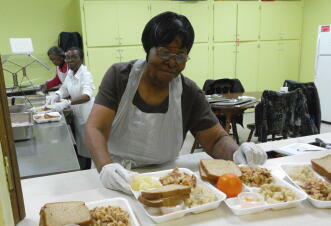 Each of the Senior Centers serves a hot meal each weekday Monday through Friday at 11:30am. Each meal served assures a minimum of one-third of the daily recommended dietary allowances. Adults enjoy good fellowship and good nutrition as a result of this service.